Former CIA chief of staff Jeremy Bash slammed the summit between President Trump and North Korean leader Kim Jong Un on Monday, saying it was disgusting to see the U.S. flag alongside that from the "despotic regime" of Pyongyang. "A summit is not an accomplishment for the American president," Bash told MSNBC's Brian Williams. "It is a major accomplishment for Kim Jong Un. 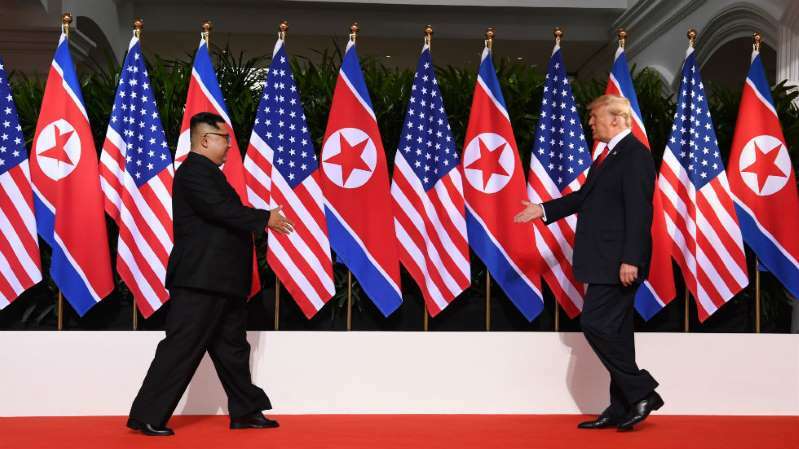 In fact, the spectacle of seeing the American flags along with the [North Korean] flags as the backdrop for that handshake is really jarring actually to see, to witness. In fact, I would say it's somewhat disgusting. It is actually a debasement of the American flag," he continued. "This is a despotic regime that murders its own citizens. And so we're putting him on the same stage as the American president. Now, hopefully, it will serve a larger purpose. Which is to ensure security for American interests and our allies on the peninsula," he said. Bash's comments come as Trump and Kim meet face-to-face, marking the first time a sitting U.S. president has sat down with a North Korean leader. The two men shook hands for the first time on Tuesday morning in Singapore before heading off with translators to take part in a one-on-one meeting. Prior to meeting with Kim, Trump predicted he would have a "terrific relationship" with the North Korean strongman. "I feel really great," Trump said. "It's going to be a great discussion and, I think, tremendous success." Kim's human rights record as a leader looms over the historic summit and has hit close to home for the president. U.S. student Otto Warmbier died last year after being detained for 17 months in North Korea. The Washington Post reported earlier this month that Trump spoke to the student's parents, Fred and Cindy Warmbier the same day he announced a date and time for the meeting with Kim.